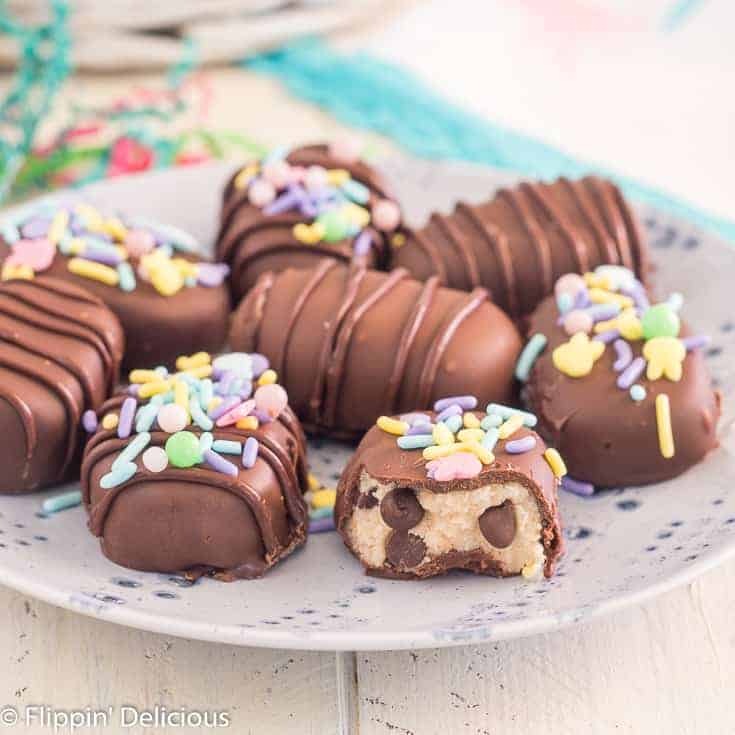 Gluten Free Vegan Cookie Dough Truffles| gluten free cookie dough (that’s safe to eat) covered in vegan chocolate. Shaped into cookie dough eggs for Easter! This post is sponsored by Enjoy Life Foods. As always, all opinions are entirely my own. Enjoy Life’s baking chocolate is a staple in our pantry, whether or not we are collaborating on a sponsored post. I’m a gluten free cookie dough fan, through and through. Over the years, not only have I made gluten free edible cookie dough (for the sole purpose of enjoying by the spoonful or with ice cream) as well as gluten free cookie dough ice cream, gluten free cookie dough pie, and gluten free brownie cookie dough truffles. 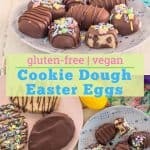 These gluten free cookie dough eggs are for all of you, who like me, love cookie dough. How do you make gluten free cookie dough safe to eat? We’ve always been warned, “don’t lick the bowl!”. If you are like me, you probably didn’t listen. However, there are some food safety risks associated with eating raw cookie dough. The main issues are eggs and uncooked flour. Both issues are easily solved so you can make gluten free cookie dough that is safe to eat. Don’t use eggs. Or use a pasteurized egg that is safe to eat raw. I avoid eggs entirely in my recipe, adding just enough dairy free milk to my cookie dough to get it to a spoon-able texture. Cook your gluten free flour. Your flour “may” have bacteria in it, so even if you make an egg-free dough it is still a good idea to toast your flour just in case. I bake my gluten free flour o a sheet pan or in a casserole dish at 350°f for 10-15 minutes. It doesn’t take long. Not only does baking your gluten free flour make it safe to eat, it makes your cookie dough taste better because you lost the raw, starchy taste. I adapted my gluten free cookie dough recipe to make a little bit of a bigger batch, so I could make enough gluten free chocolate dipped cookie dough bites to share with my family. I also changed the ratio a little bit, adding a little more flour so that the cookie dough isn’t quite as sweet, since it is going to be enrobed in vegan chocolate. Adding extra flour prevents the finished vegan chocolate covered cookie dough bites from being too sweet. How to make cookie dough gluten free? The only thing you have to do to make edible cookie dough gluten free is to use a gluten free flour. 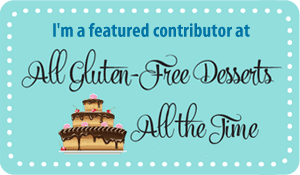 All of the other ingredients are naturally gluten free. 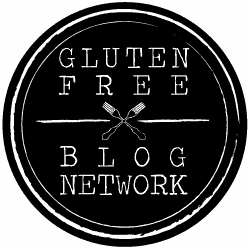 Which gluten free flour should I use? You can use any gluten free flour that you like that tastes good. Many gluten free flours can have a strong taste, so I recommend staying away from any gluten free flour with chickpea flour, or with a lot of quinoa. You don’t need a gluten free flour with xanthan gum, but it won’t hurt your cookie dough truffles if you use a gluten free flour blend that already has xanthan gum or guar gum. I used my gluten free flour blend. It is rice based, with plenty of starch for a smooth mouthfeel for even unbaked cookie dough candies. How to make cookie dough vegan? This is where the cookie dough gets trickier. We aren’t using eggs, because we are making an edible cookie dough. However, cookie dough is normally made with butter. How do you make cookie dough dairy free? To make my edible cookie dough dairy free and vegan, I use vegan butter and palm shortening instead of the butter. I prefer using half vegan butter, half shortening. You can use all vegan butter or all shortening if you prefer. If you aren’t vegan or dairy-free, you can use ½ cup of butter instead of the vegan butter and palm shortening listed. 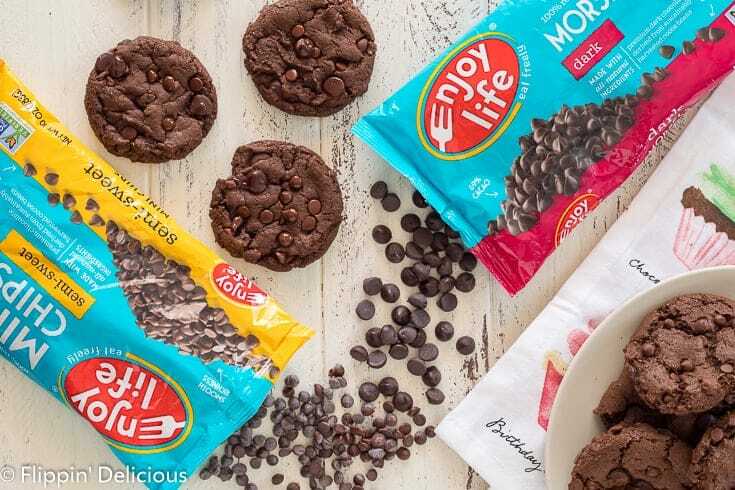 Most chocolate chips aren’t vegan, but all of Enjoy Life’s Baking Chocolate is! I used Enjoy Life’s Mini Chips. They only have 3 ingredients: Cane Sugar, Unsweetened Chocolate, and Cocoa Butter. Because it doesn’t have any stabilizers, or lethicins, it works great both as chocolate chips in gluten free cookie dough, as well as for melting. 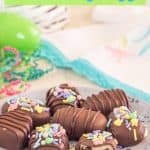 How to shape cookie dough eggs? There are two ways to easily shape your gluten free cookie dough egg truffles before dipping them in chocolate. Use a small or large egg-shaped cookie cutter. Cut circles (or roll the dough into balls) and then gently pinch into an egg shape. 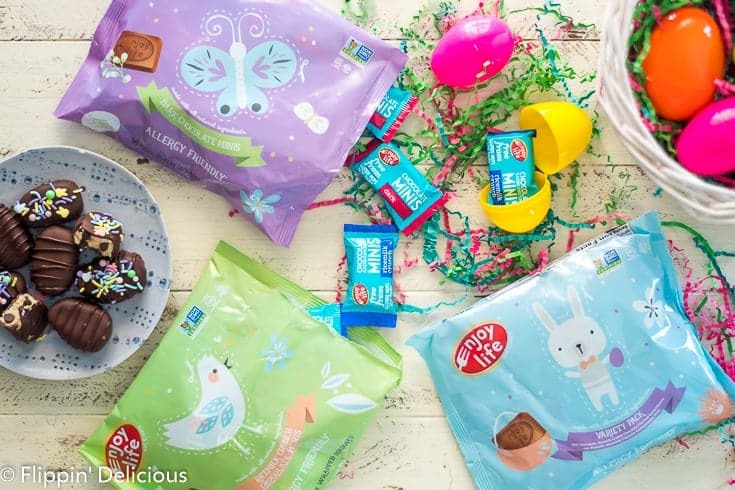 The giant gluten free cookie dough eggs would be a great chocolate bunny replacement in your Easter Baskets! I’d recommend wrapping them in plastic wrap or cellophane so they don’t make a mess. 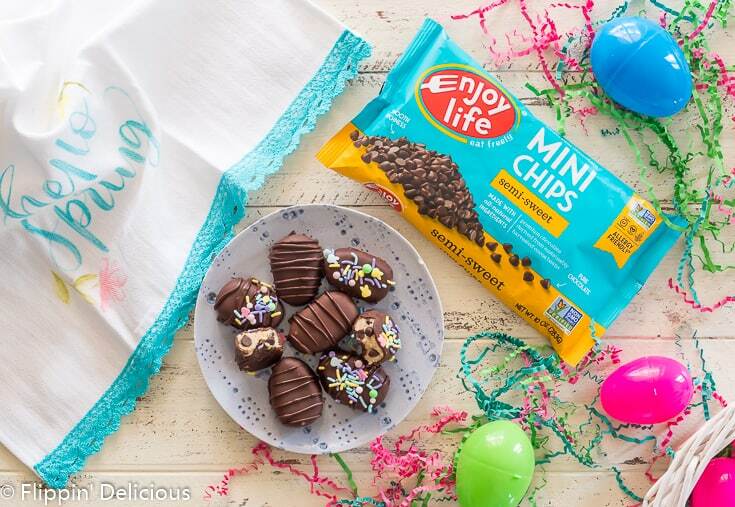 Don’t forget to pick-up or order some of Enjoy Life’s Easter Chocolate Minis. My kids love the fun packaging. Each of the cartoons on the front have a name, and they are really fun to use to decorate Easter crafts. My daughter used all of the Valentine Mini characters to decorate her Valentine mail box she brought to school. We look forward to each seasonal design of Chocolate Minis. Gently hold the circle or a flattened ball of cookie dough between the thumb and pointer finger of your non-dominate hand. Using your thumb and two fingers, gently pinch the top of the round into an egg shape. Chill your cookie dough truffles before dipping. 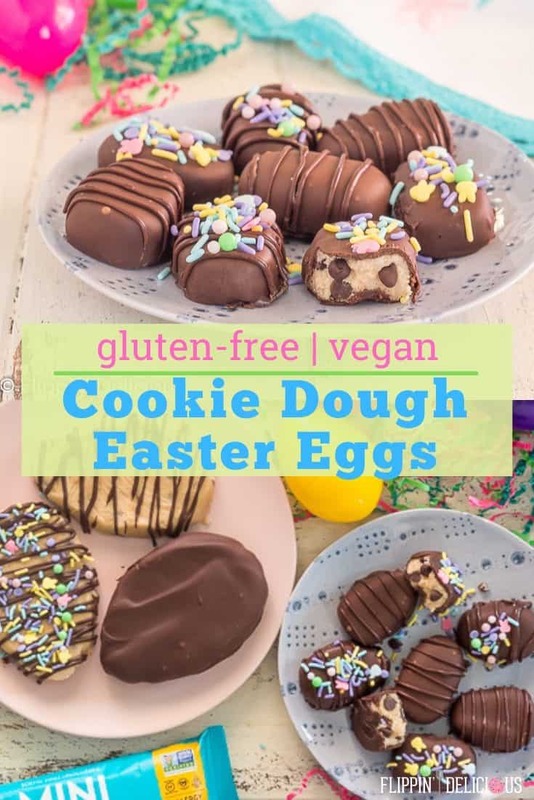 After shaping, place your gluten free cookie dough eggs on a piece of parchment paper or plastic wrap inside of a container, and chill thoroughly. I popped mine in the freezer for 30 minutes to an hour. You can also freeze them all the way, which will make the chocolate coating on the dairy free cookie dough eggs set up very quickly. How to melt vegan chocolate for dipping candy? My go-to dairy free, vegan chocolate is Enjoy Life’s Baking Chocolate. I used their Mini Chips both inside the cookie dough, and to melt for dipping the vegan cookie dough eggs. I add just a little palm shortening to the Mini Chips before melting them. This make it easier to get the right consistency for dipping, and leaves the chocolate extra shiny as it sets. Most chocolate chips don’t melt well for dipping candies, but Enjoy Life’s Baking Chocolate is the exception. They don’t have any lethicin, or stabilizers so they melt smoothly. How to melt vegan chocolate in the microwave? I like to melt my chocolate for dipping in the microwave because it is quick, easy, and I don’t risk burning it. The secret to getting your chocolate to set up with a snap is to not over heat it. You want to melt it so that there are still some un-melted chips, and then let them finish melting as you let the chocolate sit for a moment, and then stir again. If you accidentally melt your chocolate all the way, simply stir in a few extra spoonfuls of Mini Chips to bring the chocolate temperature back down. This isn’t technically tempering, which is a process of heating the chocolate to a certain temperature and then cooling to a specific temperature so it will set up quickly, shiny, and with a snap. My method yields similar results, that are perfect for the home baker. 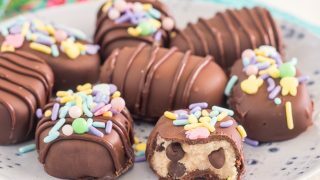 How to dip cookie dough truffles in chocolate? Once your baking chocolate is melted, and cooled so it is about body temperature, place a cookie dough egg into the melted chocolate. 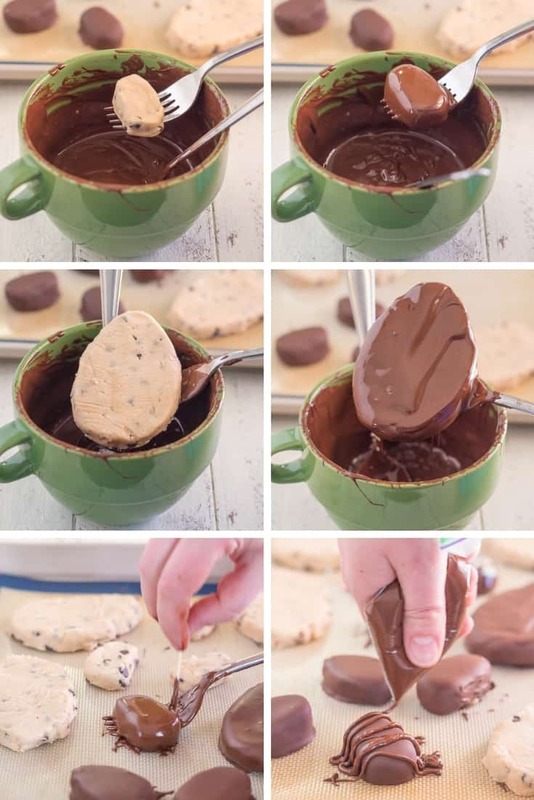 Spoon the melted chocolate over the top of the cookie dough egg. Gently scoop the cookie dough egg out of the chocolate using a fork. Tap the fork against the edge of the bowl gently, which will help the excess chocolate to drip off. Move the chocolate-dipped cookie dough egg to baking sheet lined with parchment paper or a silicone baking mat. Use a toothpick to help slide the chocolate covered cookie dough egg off of the fork. 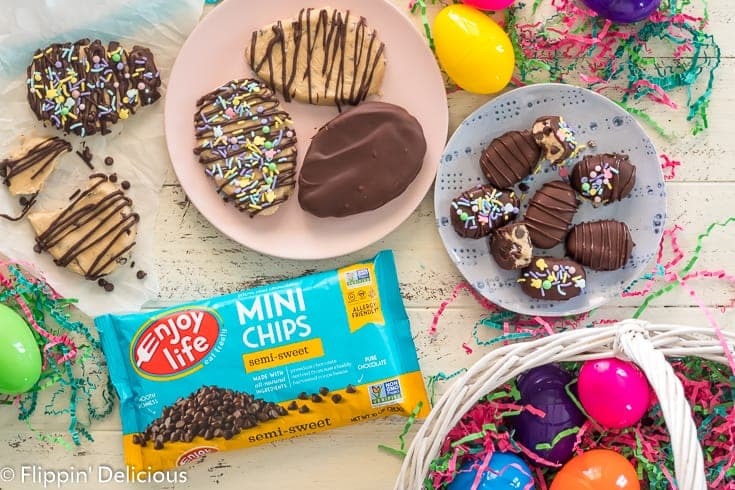 After all of the cookie dough eggs are covered in chocolate, you can spoon leftover melted chocolate into a sandwich bag. Then snip the corner off and use the sandwich bag to pipe or drizzle the melted chocolate over the cookie dough eggs. 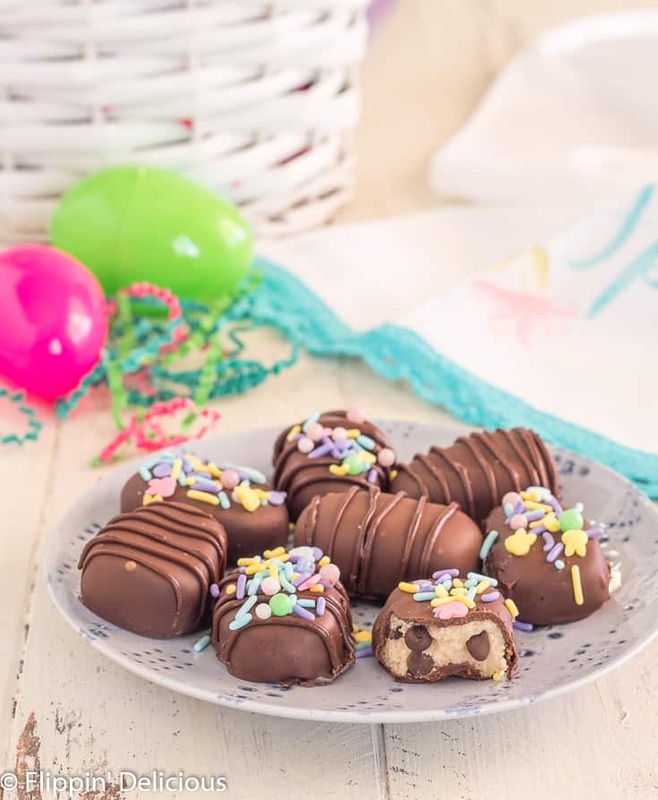 You can also sprinkle the chocolate covered cookie dough truffles with gluten free Easter sprinkles before the chocolate sets. If you don’t want to dip your cookie dough eggs, you can simply drizzle them in melted chocolate. If desired, you can decorate them with festive Easter sprinkles. I only dipped one of the big cookie dough eggs, and I drizzled the rest. 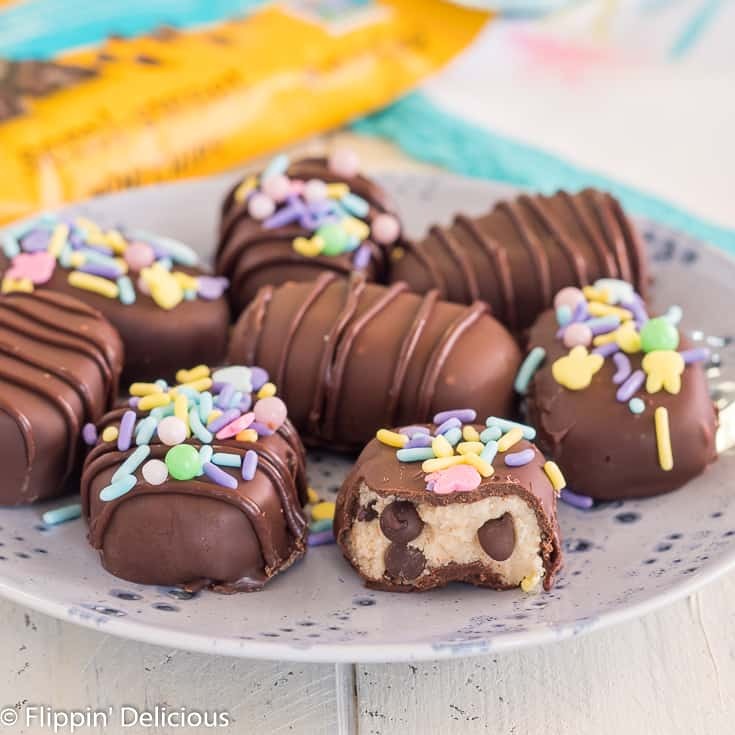 Gluten Free Vegan Cookie Dough Truffles| gluten free cookie dough (that's safe to eat) covered in vegan chocolate. Shaped into cookie dough eggs for Easter! Preheat your oven to 350°f and spread your gluten free flour on a baking sheet. Bake for 10-15 minutes, stirring occasionally. Cool. Mix together the vegan butter, palm shortening, and brown sugar until fluffy and creamy. Add vanilla extract, and stir until combined. Add the cooled gluten-free flour and stir until combined. Add a little dairy free milk. If it is too dry add a little more milk and stir until smooth. Stir in the Mini Chips. 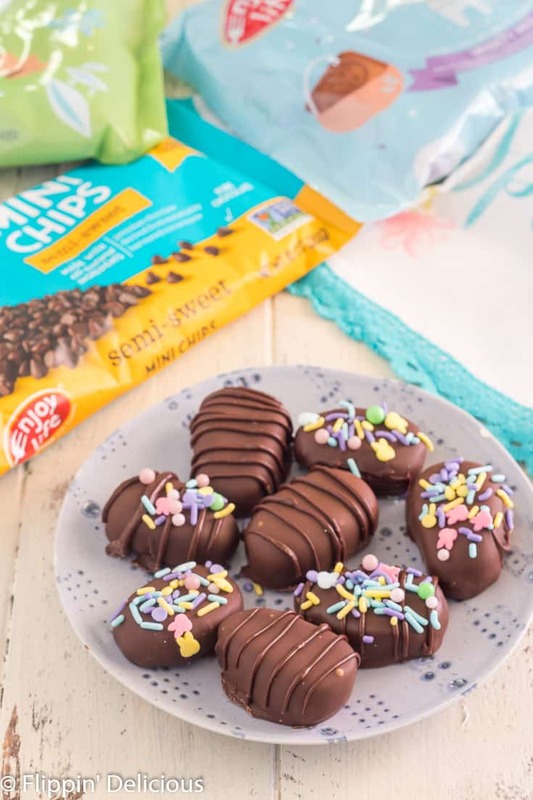 In a microwave safe bowl, melt the Mini Chips and palm shortening for the chocolate coating by heating for 30 second intervals until it is almost smooth. Let the residual heat melt it completely. Let cool to body temperature before dipping. Dip each truffle into the chocolate. Remove with a fork, let the excess chocolate drip off, and place each chocolate covered cookie dough truffle on a piece of parchment paper, or a silicone baking mat for the chocolate to set. If desired, decorate with sprinkles or melted chocolate.